​Can I bring my own food into the brewery taproom? Absolutely! We will not be offering food service in the brewery. You can bring food from home, food from a fast food restaurant, or order food to be delivered to the brewery. We have menus available here for Joe’s, Savoia’s, and Los Tres Caminos. Can I bring someone under the age of 21 into the brewery taproom? Sure! Minors are allowed in the brewery as long as they are accompanied by an adult. Will you fill other breweries' growlers? Yes we will. The growler must be clean and marked with the government's alcohol warning on it. We will use tape to denote that the growler was filled at Lot 50 Brewing. 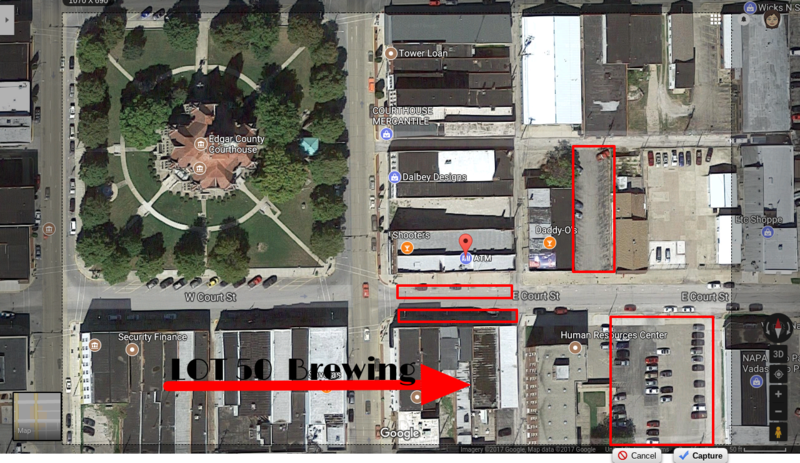 There is parking on the street in front of the brewery. There is also a lot to the East on the North side. After 5 p.m., you can park on the Human Resource Center's parking lot as well. The parking areas are outlined in red.